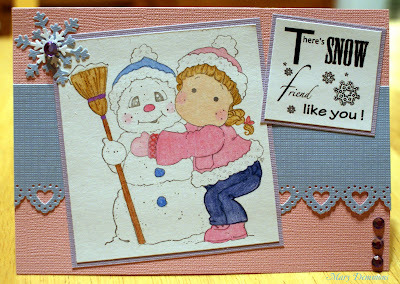 Here is a card that I made using Snowy Hug from Magnolia Stamps. I colored the image using crayola and prisma colored pencils. The base of my card is pastel pink. I added a strip of pastel blue across the middle. I punched the bottom of the strip using a lace heart border punch from Martha Stewart Crafts. I backed the image and the sentiment in pastel purple. The sentiment that I used is part of a digital stamp set (Eggbert Winter) from Bugaboo Stamps. In the upper left corner I added a pastel blue snowflake and added a smaller white snowflake in the center. I added a light purple rhinestone to the center of the snowflake and 3 more to the bottom right corner. Beautiful card Mary, I love the soft colours & that sentiment is just perfect! Thank you for playing at Delicious Doodles this week, and good luck! THis is very sweet! Thanks for joining us at SS! I love the colors you picked! Terrific job! Thanks so much for playing along with us this week at PIO! We hope to see you back next week! A beautiful card, Thanks for joining us at DCD. A Friend is. . .